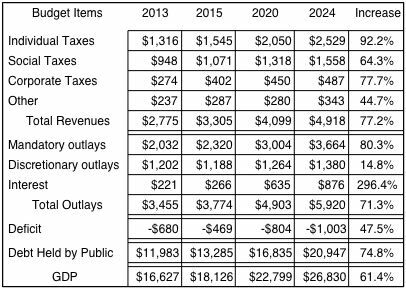 an expansion of federal subsidies for health insurance, and growing interest payments on federal debt. to be greater than their 40-year averages as a percentage of GDP. federal debt equaled just 35 percent of GDP. be unable to borrow at affordable rates. The consequences of the projected U.S. budgets on retired seniors are far reaching. There will be huge increase in individual taxes, as seniors with accumulated savings will be required to share an increased part of their holdings with tax authorities.